PIC Sound Multiplayer | Enide! It is an expansion to the original project Pic Sound Player that doesn't require the sound to be compiled with the player code. The audio clips reside in an external eeprom with a very simple file allocation table. 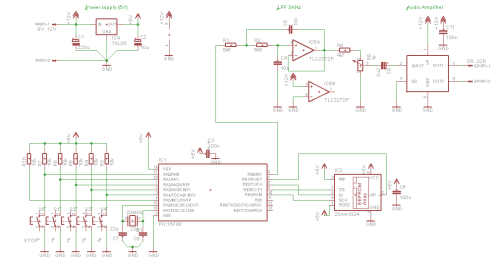 This eeprom can be swapped without the need to change the player code, changing the audio clips being played. Currently up to 4 audio clips can be stored in the eeprom. This limitation is mostly due to the number of buttons on the PCB but the player software is not limited in any way to the number of audio clips it can play, nor their size (16MB max). If a future version of this project is released it will be able to read audio files from an sd card, allowing almost unlimited size audio clips to be played, but always as wave files. The schematic, shown below, has 3 distinct areas. 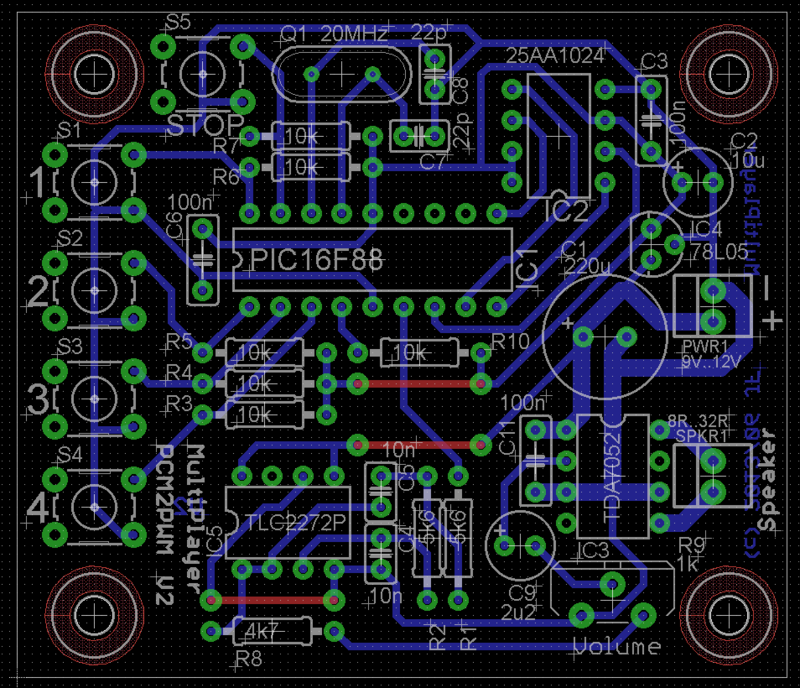 The 5V power supply is in the upper left corner of the image. 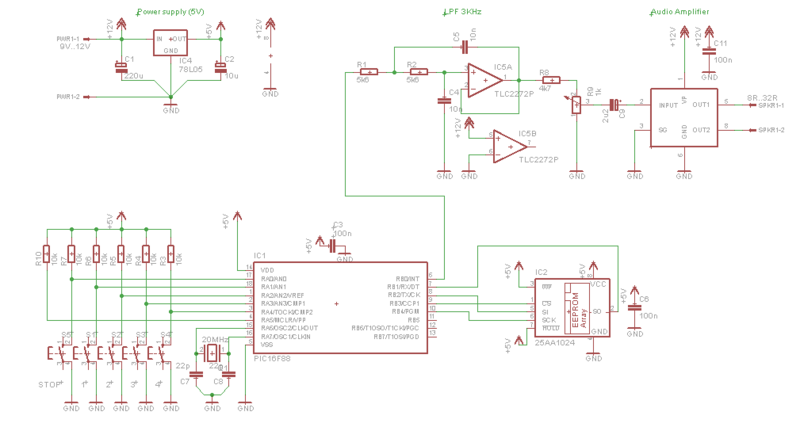 It provides stabilized voltage to the microcontroller and eeprom. The analog audio section is at the top right of the schematic. 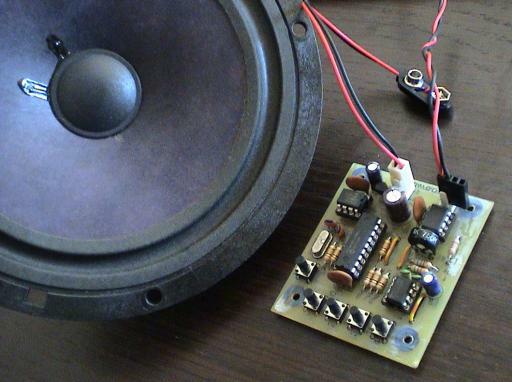 It consists of a second order 3KHz low-pass filter, implemented around a TL2272 op-amp, followed by a 1Watt TDA7052 power amplifier. 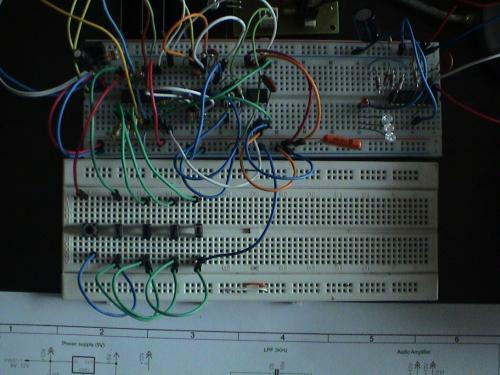 The analog section is powered directly from the input voltage and requires at least 7V to work properly. 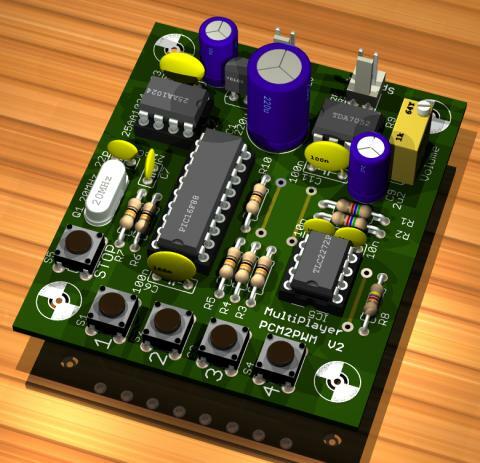 The bottom part of the schematic is the digital player and it consists of a PIC16F88, buttons and 25AA1024 eeprom. 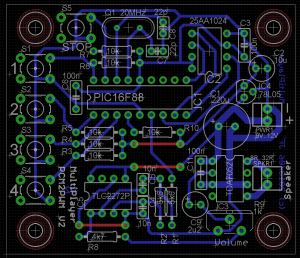 The PCB is is a bit large as a result of using only through-hole components so it can be easily made at home. 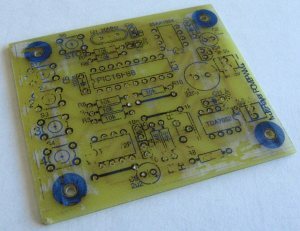 These are the pictures of the prototype PCB made using the toner transfer method. It was ready to begin placing components. 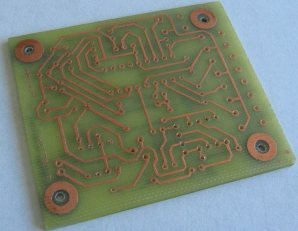 The prototype PCB is slightly different from the published PCB on this page because I found and removed a mistake from the analog section after building it. Now the prototype has a few wrapping wires at the bottom side, and some tracks have been cut. audio samples fetched from the buffer being played using Timer 1 interrupt at 8000Hz. 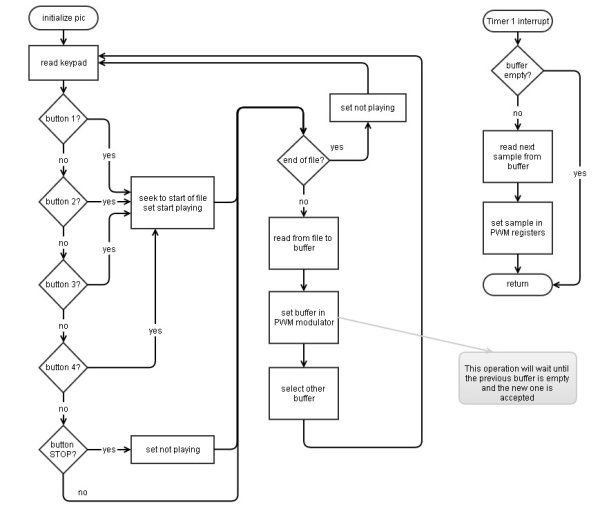 A picture says more than a thousand words and the flowchart is self explanatory. I also developed a tool to create eeprom image files. It reads wave files and copies their audio PCM samples into the final eepromfs.bin file together with a simple index (named file table). Each file entry consists of a start address and the length in bytes. The start address uses 3 bytes and the length also 3 bytes. All 4 file entries are placed at the beginning of the eeprom. The audio PCM samples come after the file table. The player reads the file table at start and then jumps to the correct start address of the file selected from the buttons. It will read and play as many audio samples as there are in the length of that file. To create the eepromfs.bin file to save to the eeprom you can use the makeeepromfs utility available below for download. Either you forgot to write which files I should use or you entered too many files. Cannot run with 0 files. Minimum is 1 and maximum is 4. There's no total size validation so make sure you don't go beyond the last address of your eeprom. There's also an utility to check the format of the waves. It reads the wave file header and displays what it finds. SubChunk fmt = "fmt "
Now you need to burn the eepromfs.bin file to the 25AA1024 eeprom using any programmer.